Turnips in Borough Market is a fantastic fruit and veg vendor. 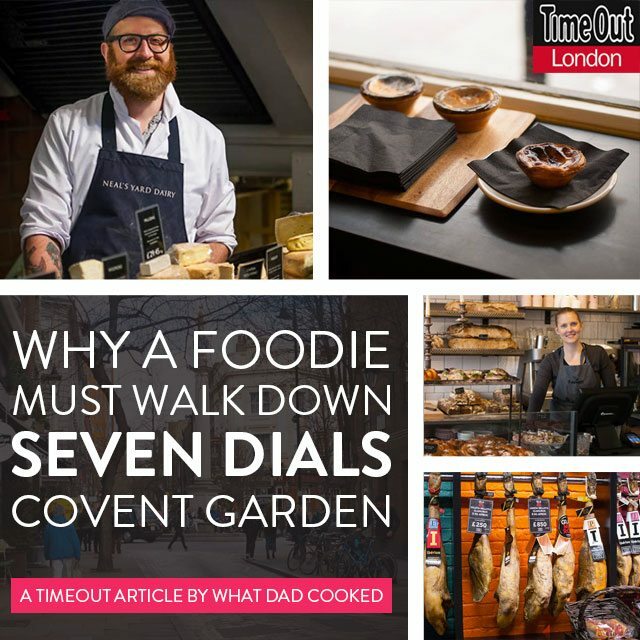 Together with all the other vendors, they make Borough market a foodie’s paradise. It’s always a challenge resisting the urge to spend too much, or buy too much to carry back to the suburbs. On this trip, I may have exceeded my limits, but I have returned home with a cornucopia of wonderful things. Pleased as I was with my purchase, I had no idea what to do with it. After some research I discovered scorzonera and salsify are very similar and often confused (indeed, I thought I had bought salsify). Scorzonera has dark skin, salsify white, while scorzonera apparently has a better taste. Both were known as the ‘vegetable oyster’, however, any taste of oyster, (like the bitterness of aubergines), has been bred out of the vegetable. Sophie Grigson warns not to expect too much from this root – but I reckon if I like artichokes I will like these: I persevere. Further investigations reveal that both roots are in the same family as burdock, so I cook the scorzonera in the style of a Japanese braised burdock or ‘goubo kinpiro’ with carrots. After par boiling, I braise the vegetables in sake, mirin, and soy and then finish with La-Yu and sesame oil and seeds. A really good side dish to a teriyaki onglet. These were being sold at a slight discount in fives. So I bought five. 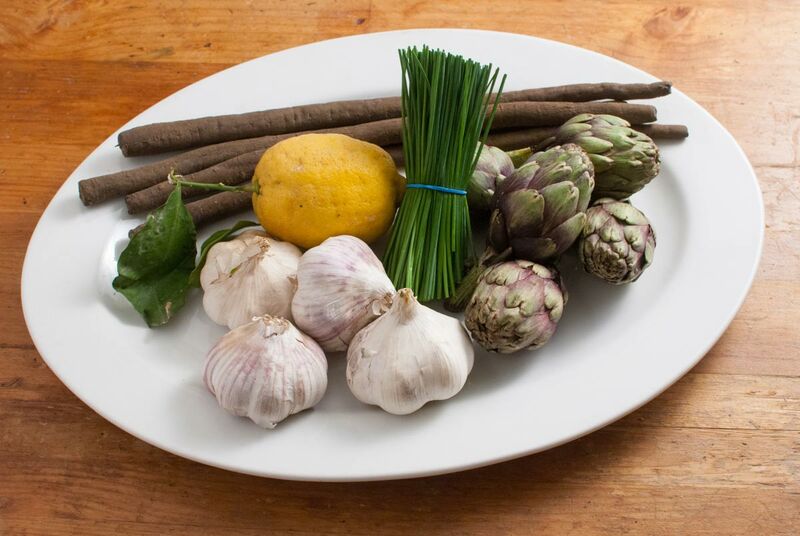 I was pleased with my purchase and, unlike the scorzonera, I did know what to do with them – they went into my signature artichoke and tomato pasta dish. Provenance matters when it comes to garlic – French is best, I bought two white and two blue types. I sometimes buy my garlic braided in strings. Short of buying direct from an ‘Onion Johnny’ this seems as good a guarantee as any that they will have been grown in France. Spanish garlic is good. Chinese garlic is not – the large white bulbs from this new production area have an overpowering strength and pungency. They’ve ruined many of my meals. The French garlic is smooth and subtle and enhances all my meals. Lemonade, including the zest, which is allowed to steep for an hour, and then strained. Granita – steeping the juice as above. Candied lemon peel – strips of peel boiled repeatedly and then candied in syrup. Lemon tart – this also should include the zest whilst making custard filling – strain before pouring in pastry case. I grated the zest, and squeezed the juice of my lemon over asparagus pasta. I have a good supplier of chives nearer home, but these have an appealing thin, hollow stiffness to them. They spring and pop over the chopping board when I cut them. I admit it. I have never seen these. They are not are rare as I imagined – an albino redcurrant apparently. I bought them because they were beautiful and edible. What a strawberry! Each one as big as a golf ball. Sweet, juicy, succulent – perfectly balancing sweet and sour. You just need to eat these from the punnet. Otherwise, they are good however you like – I put mine on top of a strawberry tart – their size added to the impact.